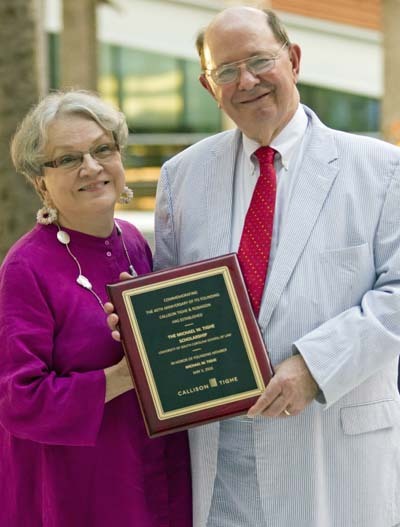 COLUMBIA, SOUTH CAROLINA – In honor of the firm’s 45th anniversary and one of its founder’s 75th birthday, Callison Tighe & Robinson has established the perpetual Michael W. Tighe Law Scholarship at the University of South Carolina School of Law. 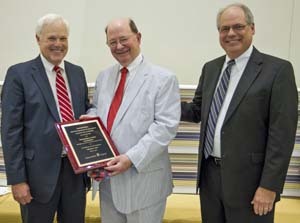 The scholarship for worthy students attending the law school was announced May 3 at a celebration of Tighe’s 75th birthday. Firm co-founder Preston Callison, now 93, was on hand as USC Law School Dean Robert M. Wilcox announced the scholarship. Senior Member Ralph C. Robinson also joined in, as did Tighe’s wife Judy and his children Hagood and Harlow. In announcing the scholarship to the crowd of 200 people who gathered to honor Tighe, firm member Rick Detwiler outlined Tighe’s contributions to both the legal profession and to the community, from cooking meals for the homeless to his service on a non-profit board of Welvista, an organization that helps assure people in need of their necessary prescription medications. Detwiler also praised Tighe’s outstanding leadership. Detwiler called the scholarship a fitting way to honor the career of a man who has inspired others with his leadership, professionalism and dedication. Tighe began practicing law 52 years ago. After serving as a U.S. Air Force officer, including a tour in Korea, and as an assistant attorney general for South Carolina, Tighe teamed up with Mr. Callison to form the firm in 1971. Today, he continues his practice, frequently representing title companies and their insureds. He’s also a certified arbitrator and mediator. Tighe was shocked when the scholarship was announced. “I was surprised and humbled by this singular honor my law partners have given me,” he said.